Ashaway, RI — “When I first tried the shoes, it felt like I was putting on slippers,” said squash great, Natalie Grainger, of her new Ashaway AMPS™ 301 Squash Shoes. Grainger is currently ranked #1 in the US and #4 on the Women’s International Squash Players Association (WISPA) Tour. She is also a member of the US Squash Team, President of the Board of WISPA, and Head Coach for the US Under 23 Development Program. 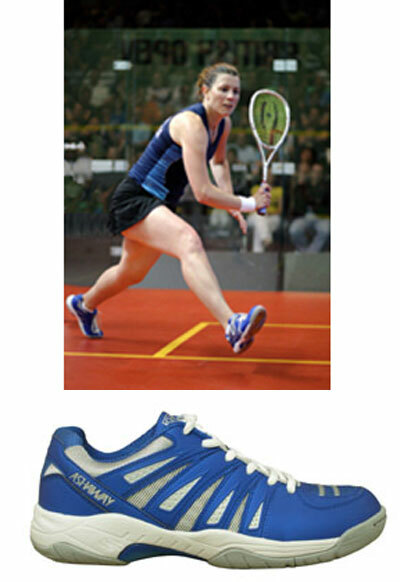 An Ashaway sponsored player, she helped evaluate the new line of squash shoes which were introduced in early 2008. Designed for both serious and recreational players who want a dynamic look, ultra comfort, and enhanced performance, Ashaway’s AMPS 301 shoes are anatomically molded to the natural shape of the human foot. The shoes utilize an Anatomic Multi-Performance System (AMPS) which supports the whole foot, not just the ball and heel, thus increasing comfort and stability, and reducing foot fatigue. Built for speed and traction, the AMPS design incorporates wet-grip rubber outsoles which provide high durability and incredible grip, even on wet surfaces. A high quality synthetic and mesh upper provides lightweight comfort and breathability, while the high quality PVC heel counter provides increased strength for maximum ankle support. The key to that comfort is the combination of an anatomically shaped mid-sole high rebound insert, an ASD (Anatomic Stability Device) inserted into the heel of the shoe, a specially designed dual layer inboard, and triple layer removable insoles. The dual layer inboard is engineered to provide added strength and cushioning. The high shape retention EVA insole incorporates AMPS Zz cushion inserts to enhance forefoot rebound and provide additional heel support. The insoles are also 25% lighter than normal EVA for increased speed and comfort.